Nashville, TN – The Jacksonville Jaguars are the Tennessee Titans’ longest-standing division rival. The clubs have met at least twice each year since Jacksonville began play as an expansion franchise in 1995. For the first seven seasons of the rivalry they played in the AFC Central, and for the last 17 years they have been members of the AFC South. The teams have met a total of 48 times, with the Titans holding a 28-20 advantage. For eight consecutive seasons (2009–2016), the Titans and Jaguars split the annual series before Tennessee took both matchups in 2017. The Titans won the first matchup of 2018 in Jacksonville, played on September 23rd. Five total field goals made up all of the scoring as the Titans won 9-6. Marcus Mariota did not start due to an injury but came off the bench to lead the team to its third consecutive win over the Jaguars. The last meeting at Nissan Stadium was the 2017 finale on New Year’s Eve. With the Jaguars having already clinched the AFC South, the Titans clinched a playoff berth of their own with a 15-10 victory. 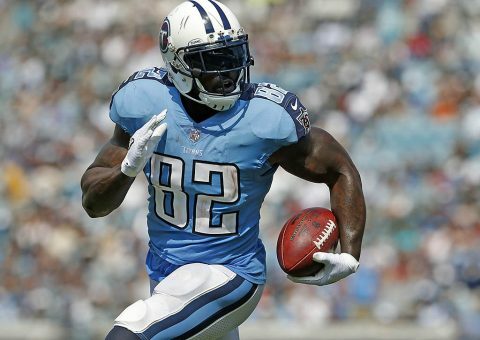 Mariota completed a 66-yard touchdown pass on a screen to running back Derrick Henry, and the Titans defense forced four turnovers, including a pair of interceptions by safety Kevin Byard. The 2017 finale was the second time in as many years a late-season Titans-Jaguars game has had postseason implications. On December 24th, 2016, the Titans traveled to Jacksonville needing a win to keep their playoff hopes alive. It was not to be, as the Jaguars turned them away 38-17. The Titans have posted two separate five-game winning streaks against the Jaguars, dating from 1998-00 and 2001-03. Jacksonville’s longest winning streak in the series was a four-game run from 1996-98. The stakes of the rivalry were never higher than in 1999, when the Titans and Jaguars met three times, including the AFC Championship Game in Jacksonville. Steve McNair rushed for two touchdowns and Derrick Mason returned a kickoff 80 yards for a touchdown as the Titans earned their first Super Bowl berth with a 33-14 win. Tennessee went on to Super Bowl XXXIV and eventually fell at the hands of the St. Louis Rams, 23-16. The Jaguars played their first game in franchise history against the then-Houston Oilers on September 3rd, 1995. In Jacksonville, the Oilers won the game by a 10-3 final score. In a Thursday night game, the Titans score 27 points and shut out the Jaguars in the first half. The Titans score on six consecutive possessions. Marcus Mariota completes 18 of 22 passes for 270 yards with touchdown passes to Kendall Wright and Rishard Matthews. DeMarco Murray accounts for 123 of the team’s 214 rushing yards, and he and rookie Derrick Henry (60 rushing yards) each run for a touchdown. The Titans total 494 yards on offense and convert 60 percent on third down. Blake Bortles completes 26 of 38 passes for 325 yards and a touchdown and adds a touchdown reception in the fourth quarter. Jaguars receiver Allen Robinson catches nine passes for 147 yards. Titans starter Marcus Mariota leaves the game late in the third quarter with a right leg injury and is relieved by Matt Cassel. Jason Myers boots four field goals for the Jaguars. Jaguars cornerback Jalen Ramsey caps the victory with an interception return for a touchdown. After falling behind 3-0, the Titans score the game’s next 30 points and finish six consecutive possessions with scores. The Titans’ tally includes 31 points in the second half. The Titans defense recovers a Blake Bortles fumble and gets interceptions from Da’Norris Searcy and Curtis Riley. Derrick Henry rushes for 92 yards on 14 carries, including a 17-yard touchdown. Rookie tight end Jonnu Smith scores his first career touchdown on a 32-yard screen play. The Titans force four turnovers and record two sacks to clinch their first playoff berth since 2008. Marcus Mariota passes for 134 yards, including a 66-yard touchdown on a screen pass to Derrick Henry in the second quarter. Mariota rushes for 60 yards, and Henry adds 51 rushing yards. Kevin Byard notches two interceptions off Blake Bortles. Ryan Succop boots three field goals. Jacksonville’s touchdown comes on a 67-yard fumble return by defensive end Yannick Ngakoue. Marcus Mariota does not start due to an elbow injury but comes off the bench in the first quarter after Blaine Gabbert exits with a concussion. Ryan Succop boots three field goals, including the game-winning 28-yarder with 4:06 remaining. The Titans rush for 150 yards, including 57 by Derrick Henry and 51 by Mariota.